The third report for IMH 'Iraqi media house', had monitored about 61 websites for government institutions, including media platforms for the three presidencies, and the ministries and independent bodies, and provincial councils and local governments. The report was adopted basic standards in monitoring, the priority went to providing informative service needed by the audience in compare to the terms of transparency, as well as the quality and efficiency of the sites in browsing, access and communication with the targeted public of the service. The monitoring included  Websites belong to the three presidencies [Republic, ministers, parliament], as well as the three presidencies in the Kurdistan region [president, prime minister, parliament] and the judiciary. During monitoring we achieved a number of observations regarding the websites identities, services provided by the multilingual features, allowing users to communicate with site management, the number of visitors counter, and search service at the websites. 7 websites are limited to their institutions' news publishing, and don't deal with general news, namely, [presidency, prime minister, House of Representatives, Presidency of Kurdistan region, Kurdistan Regional Government, KRG parliament, and the judiciary], that equals to % 88 of the monitoring sample of 'private presidential websites'; while only one website, which belongs to the General Secretariat of Ministers council deploys interactive and general news. 7 websites do not publish the names of editorial board members, namely [presidency, prime minister, General Secretariat of Ministers council, Council of Representatives, Presidency of the Kurdistan region, Kurdistan Regional Government, KRG parliament] that equal to %88 from monitoring sample, while one site which is the judicial authority publishes its editorial board members. One site of the monitoring sample does not provide English language service, which is the judicial authority site, and this equals to %12, while  websites provide English language service, which are [presidency, prime minister, General Secretariat of Ministers' council, Representatives council, presidency Kurdistan, KRG, Parliament of Kurdistan province]. 3 websites do not provide Kurdish language service, namely [head of government, General Secretariat of Ministers' Council, the judiciary], which equal to %38 of monitoring sample, while the  websites of [presidency, parliament, presidency of Kurdistan region, KRG, Parliament of Kurdistan province] provide this service. All websites do not allow comments by visitors on the publications of their content. 6 websites do not reveal the number of their visitors, namely [presidency, prime minister, General Secretariat of Ministers Council, Representatives Council, Presidency of the Kurdistan region, Parliament of Kurdistan Region], those are equal to %75 of monitoring sample, while the websites that reveal their visitors number are , [Kurdistan Region Government, the judiciary]. Only one website do not allow communicating with its management, that is the presidency, which equals to %12 of monitoring sample, while  websites contain this service, namely, [head of government, General Secretariat of Ministers Council, Representatives council, Presidency of the Kurdistan region, the Kurdistan Regional Government, KRG parliament, the judiciary]. One site only does not provide Content Search Service, that is the prime minister, its rate of monitoring sample is %12, while  websites provide this service, they are [presidency, General Secretariat of Ministers council, Representatives council, Presidency of the Kurdistan region, the Kurdistan Regional Government, Parliament of Kurdistan Region, the judiciary]. 7 websites do not have mobile apps, %88 of monitoring sample, they are [presidency, prime minister, Presidency of Kurdistan region, Kurdistan Region Government, KRG parliament, House of Representatives, the judiciary], while one website [General Secretariat of Ministers Council] owns this service. Three presidencies' websites [presidency, prime minister, parliament], and Kurdistan region presidencies [presidency of the region, government of the region, the region's parliament] are characterized with being very-well designed, and have a direct and simplified browsing mechanism. Monitoring included  websites belong to sovereign ministries, namely, [Defense, Interior, Foreign Affairs, Finance, oil]. websites do not publish general news and confined to their own institutions, they are the ministers of [defense, foreign affairs, oil, and finance], which equal to %80 of monitoring sample, while only a single website provides the interactive news service, that is the ministry of interior website. All websites of sovereign ministries do not publish editorial board members. Two websites do not provide English language service, namely [ministries of: defense, and interior], %40 of monitoring sample, while this service is available in  websites which are ministries of [foreign Affairs, finance, and oil]. All websites of sovereign ministries do not provide Kurdish language service. All websites do not allow visitors' comments on their posted topics. A single website does not disclose the number of visitors, which is [ministry of finance] that equals to % 20 of monitoring sample, while the rest websites [interior, defense, foreign, and oil] provide this service. All websites of sovereign ministries provide the management' contact service. One website does not provide the Content Search Service, which is the interior ministry, that equals to %20 of monitoring sample, while the ministries of [defense, foreign affairs, finance, oil] websites provide this service. All websites of sovereign ministries do not have mobile apps. Five sovereign ministries websites are not very well-designed, and vary in ease of browsing, also, some of them are exposed to interruptions for several days, especially the ministries of finance and oil websites. Monitoring included websites of 18 Non-sovereign ministries and 54 websites of their affiliate departments. website of ministry of education publishes on its main FrontPage a group of news that are allocated for minister 'Mohammed Iqbal', in addition to the secondary news content , which included 25 news have published during the monitoring period, as %12 of them were allocated for minister, while the remaining percentage was allocated to the activity news of the ministry and its directorates; However, the links of social networking sites [Facebook, Twitter, YouTube and Google Plus] that are published on the official website of the ministry of education, have been linked to the education minister's personal websites that are unrelated to the press office of the mentioned ministry. Monitoring Report noticed that the ministry of higher education website is one of the most active governmental websites, where it publishes universities and colleges affiliated activities, however it also publishes 8 News of the minister activities out of 10 news that are published prominently [flash], while %04 of the news was allocated to the minister, out of the last 25 articles that was published in the secondary news content. In the ministry of environment website, the minister news and activities occupy the prominent space [Flash] on the FrontPage, while %38.8 of the whole website posted news was particularly for the minister, as 7 minister news out of 18 other news published on the mentioned page. Ministry of human rights published 21 news story out of 30 prominently [flash] related to the minister's activities, while %32 of the last 25 news published on the ministry page was allocated to the minister. Ministry of water resources does not publish any news prominently [flash], while the news & events of the minister constitute %96 of the 25 last news story posted on the website, viz 24 out of 25; And the minister's personal photo is used as the prominent image on the ministry's website on Facebook. The ministry of justice specified two announcements out of 5 news published prominently [flash] for the activities of the minister in its website, while covered %85 of the last 25 news on the page. The ministry of health website covered all the minister's news prominently, while posted 17 news story about the out of 25 observed articles, viz %68; The report noticed that the ministry did not publish links for pages related to it on social networking websites. The ministry of communications website published only 6 news stories about the ministry's activities, 4 of which are allocated for the minister's activities. Ministry of housing and construction had the highest proportion of publishing news specified to its minister, where his activities occupied all prominent news [Flash], while 23 out of 25 news stories, viz %92 are in the secondary news content. The Ministry owns pages on Twitter and YouTube, but not on Facebook. Monitoring report found that the ministry of industry website specified its minister with three news stories only out of 25, viz% 12, and it development his CV on a non-remarkable place. The commerce department website has recorded %22 as the proportion of news dedicated to the minister, or by 9 news out of 25. Ministry of culture published 4 prominent news about the minister activities out of 6, while %16 [4 news] of the last 25 devoted to the minister on the secondary news content; the ministry site does not publish links refer to their official pages on social networking websites. The activities of the minister of science and technology occupy all highlighted news on the ministry's website, while the published news of him on the secondary news content equals %16, viz  out of the last 25 publications. The activities of minister of labour and Social Affairs occupy full space of the news highlights on the ministry's website, while 8 news out of 25, allocated for the minister in secondary news content, viz %32. News published on the ministry of Planning website ad hoc %100 for minister's activities, while pictures related to his activities are the most interested by the website, also, the ministry website provides the minister's personal page on Facebook, while it does not publish any links of its public pages on social networking websites. 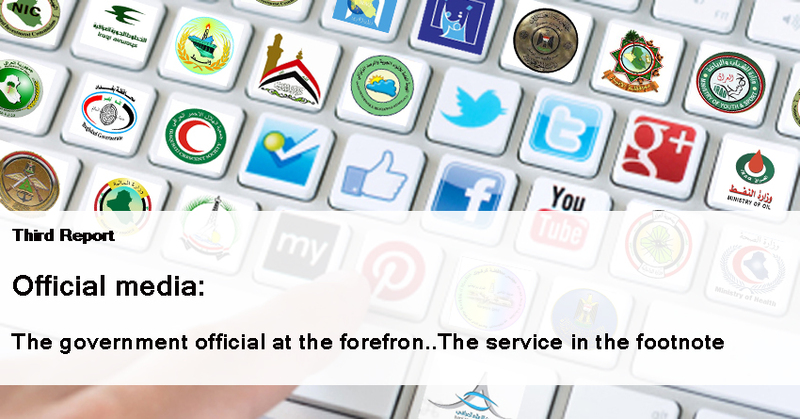 During the monitoring period, it has been noticed that all ministries websites mention their officials and employees names by %100, who have been sent by their constituencies on missions inside and outside Iraq, and all websites have the means of communication which allow visitors to send their feedbacks and comments to the ministry. All ministries' websites except the Ministry of Justice indicates that they either have newspapers, magazines, or printed publications, while they all publish their ministers profile biography except ministries of commerce and communication. monitoring included 13 websites affiliate to independent bodies stipulated in the Constitution, namely, [integrity, accountability and justice, the central bank, investment, Shiite endowment, Sunni Endowment, endowments of religious minorities, BSA, Iraqi Media Network, Media and Communications, Martyrs Foundation, electoral commission, Human rights Commission]. 11 sites do not publish news about their function's public service, their publications are limited on news about their own institutions, this equals to% 85 of monitoring sample, namely, [integrity, accountability and justice, central bank, investment, Shiite endowment, Sunni Endowment, endowments of religious minorities, BSA, Media and Communications Authority, Electoral Commission, Human rights Commission], while two sites offer this service which are martyrs Foundation and the Iraqi Media Network. All the websites do not publish their editorial board members. 4 websites do not provide English language service, which equals %31 of monitoring sample, and they are [accountability and justice, media and communications, Shiite endowment, endowments of religious minorities], while the rest  websites provide this service, namely, [Integrity, the central bank, investment, Sunni Endowment, BSA, Iraqi media Network, Martyrs Foundation, Electoral Commission, Human rights Commission]. 11 websites do not provide Kurdish language service, %85 of monitoring sample, namely, [integrity, accountability and justice, central bank, investment, Shiite endowment, Sunni Endowment, endowments of religious minorities, BSA, media and communications, Martyrs Foundation, Human Rights Commission ], while the two sites [electoral commission, Iraqi media Network] have this service. 12 websites do not allow comments on their publications, %92 of monitoring sample, namely, [integrity, accountability and justice, central bank, investment, Shiite endowment, Sunni Endowment, endowments of religious minorities, BSA, the Media and Communications, Martyrs Foundation, Electoral Commission, Human rights Commission], while the Iraqi media network website provide this service. 5 websites do not reveal the number of visitors, %38 of monitoring sample, which are [media and communications, central bank, endowments of religious minorities, Martyrs Foundation, Investment Authority], while the rest 8 websites [integrity, accountability and justice, Shiite Endowment, Sunni Endowment, BSA, Iraqi media Network, Electoral Commission, Human rights Commission].provide this service. Only the Shiite Endowment website does not provide the managed contact service, which accounts to monitoring sample by %8, while the other 12 websites [integrity, accountability and justice, central bank, investment, Sunni Endowment, endowments of religious minorities, BSA, Iraqi Media Network, Media and communications, Martyrs Foundation, Electoral Commission, Human rights Commission] provide this service. 4 websites, which equal %31 of monitoring sample do not provide the content search service [media and communications, central bank, endowments of religious minorities, BSA], while the rest 9 [integrity, accountability and justice, investment, Shiite endowment, Sunni endowment, Iraqi media Network, Martyrs Foundation, Electoral Commission, Human rights Commission] provide this service. 12 of the independent bodies do not own mobile apps, %92 of monitoring sample, namely, [integrity, accountability and justice, central bank, investment, Shiite endowment, Sunni Endowment, endowments of religious minorities, BSA, Iraqi Media Network, Media and Communications , Martyrs Foundation, Human rights Commission], while the Electoral Commission owns mobile apps service. It can be said that the efficiency and quality of independent bodies’ websites are ordinary in compare to the sovereign ministries and presidencies websites, and the majority of these websites suffer from difficulty in browsing and mis tabulation, as well as the difficulty of distinguishing between latest news and the old news. In our report we monitored 25 sites linked to the Iraqi governorates, including those which are organized in county. The websites are distributed unequally, as some provinces have two websites, one for divan and other for the council of province, and they publish activities of the pro, the governor and his representative, President of the Council, members of the Council, while other provinces' websites follows the divan of province or one of its constituencies and publish the local government's news and its projects in the province, as well as other general news. On the other hand, two governorates do not own websites, as they have been completely removed from the Web, while their titles are still appear on the search engines. Provinces that have official websites for their local governments are 17 out of 18, %94.4. One province does not own a website, which is [Dohuk], %5.6. Provincial divan website concentrates in publishing news and activities of the governor and his two deputies, while the provincial council website focuses on News & Events related to provincial council chairman, his deputies, and the members of the Council. 9 provinces out of 17, own one website [province's divan of: Nineveh, Anbar, Salahuddin, Kirkuk, Arbil, Sulaimaniya, Diwaniyah], [Provincial Council of: Najaf] [government contracts department - Babil province], %42.59. 16 websites out of 25 [%64], are well-designed, that are [divan of the province: Basra, Dhi Qar, Erbil, Salahaddin, Anbar, Baghdad, Karbala, Wasit, Diwaniyah, Al-Muthanna], and [council of Province: Basra, Maysan, Muthanna, Wasit, Najaf], Karbala. 8 websites [%32] are characterized by a good design [Bureau Province: Maysan, Sulaymaniyah, Nineveh, Kirkuk, Diyala], and [Province: Baghdad, Dhi Qar, Diyala Council]. One website out of 25 [%4], is designed in a modest way, as well as its browsing causes problems for the user, which is [province of Babylon - government contracts department]. Only one website out of 25 [%4], shows the names of its editorial board, [Council of Dhi Qar], while 22 sites [%96] do not refer to the names its administrators. 5 provinces websites, out of 25 [%20] provide an English copy, which are [divan of province: Diwaniyah, Najaf, Nineveh, Erbil, Diyala], in opposed to this, 20 websites [%80] do not provide such a service. Two websites out of 25 [%8] provide a Kurdish language, [divan of province of Kirkuk, and Erbil] in compare to 21 websites [%92] which do not offer a similar service. 9 websites out of 25 [%36], allow comment by visitors on its pages exclusively and within its approval's control, [divan of the province of Baghdad, Anbar, Nineveh, Salahuddin, Diyala], and [council of Province: Baghdad, Dhi Qar, Najaf, Diyala], while 16 [%64] do not allow comments. 3 websites out of 25 [%12], show the total number of visits, which are [Provincial Council of: Baghdad, Basra, Maysan], while 22 websites [%88] do not provide this data. 9 websites [%36] show the number of readings, [divan of Province: Basra, Wasit, Karbala, Salah al-Din], and [council of Province: Baghdad, Basra Council, Wasit, Maysan, Karbala], while 16 websites [%64], do not deal with this service. 7 websites [%30.43] update their content during 24-hours, [divan of Province: Basra, Karbala, Anbar, Arbil, Salah al-Din], and [council of Province: Basra, Najaf] Council. 6 websites [%24] update their content during limited hours of the day [work time], [divan of Province: Dhi Qar, Wasit, Baghdad], and [council of Province: Maysan, Wasit, Najaf Council]. 12 websites [%48] update their content daily but with unspecified timing, [divan of province of Kirkuk, Sulaymaniyah, Nineveh, Maysan, Muthanna, Diwaniya, Diyala], and [council of Province: Baghdad, Karbala, Dhi Qar, Diyala Council] as well as the [government contracts Department - Office of the province of Babylon]. 6 websites out of 25 [%24] stopped contents updating for periods ranged between 2 months - 1 year, [divan of Province: Anbar, Salahuddin, Nineveh, Diyala], and [council of Province: Dhi Qar, Diyala], while 19 websites [%86] are still following the daily update process. All of the 25 websites neither provide breaking-news service, nor own Mobile apps. The governor's name was mentioned in 24 news covered fields of his activities and meetings out of 25 news stories [%96] that have been observed according to their display order on the official webpage, while one news [%4] was allocated for an announcement of statement issued by the spokesman of the province. The head of Baghdad Provincial Council name was mentioned in 8 news [%32] which covered the presidency meetings of the provincial council and field activities out of 25 news stories that have been browsed, while the remaining 17 [%68] were distributed on news coverage of statements and activities of the members of the Board. the governor was mentioned in 18 news [%72] covered field activities and meetings out of 25 news which has been browsed according to their display order on the official webpage, while the rest 4 news [%16] was allocated for the statements of Public Information Office [PIO] for the First Deputy, and 3 news [%12] for the statements of PIO for the second deputy. The Chairman of the provincial council was mentioned 6 news covered the field activities and meetings out of the 19 news story [31.57], that were on the main and only page, and have been browsed according to their display order on the official webpage, while the remaining 4 News were specified for statements of 3 Chairmen of the Committees in the Council, [%15.77], as well as 9 news about Iraq, Arab world, security, and sports, % 47.36. The governor was mentioned once, and his deputy who is in charge now was mentioned in 12 stories out of 25 [%52] covered his meetings and field of activities, the news were undated and have been browsed according to their display order on the official webpage, also there were 2 news [%8] allocated for two chairmen of committees in the council, and 6 news [%24] about the council, and 2 more news [%8] for the public service. The governor was mentioned in 7 News [%28] covered his activities, statements of press, field statements, and meetings, out of 25 news story, that have been browsed according to their display order on the official webpage of the divan, while 6 news were allocated his deputies [%24], 3 news regarding his advisers, [%12], and three other news on service departments projects [%12], and 2 news politics on the ruling political bloc in the province, [%8]. The governor was mentioned in 7 News [%28] covered his statements for press, field statements, and meetings, out of 25 news stories, that have been browsed according to their display order on the official webpage, while 4 news [%16] was allocated for data issued by the Council, and 14 news story regarding heads of committees and members of council, which equal %56. There was 25 news [%100] about the conservative covered his statements for press, field statements, and meetings, out of 25 news story, that have been browsed according to their display order on the official webpage of the divan. The Chairman of the provincial council has been mentioned in 11 stories [%44] covered his statements for press, field statements, and meetings out of 25 news stories that have been browsed according to their display order on the official webpage, while 8 News was allocated for the meetings of Council [%32], and 6 News specified for committee chairs and members of the council [%24]. the governor was mentioned in 11 news [%44] covered his activities, statements for press, field statements, and meetings out of 25 news story, have been browsed according to their display order on the official webpage, while his deputies were mentioned in 7 News [%28], and other 7 News about the activities of his aides [%28]. The Chairman of the provincial council was mentioned in 6 News covered his statements, out of 25 news stories [%24], has been browsed according to their display order on the official webpage, while 4 News [%60] about his deputy [%16], and the heads of committees of Council were mentioned in 15 news [%60]. conservative was mentioned in 10 News [%40] covered his statements for press, field statements, out of 25 news stories, have been browsed according to their display order on the official webpage, while his deputy, administrative assistant, and one of the heads of committees of Council were mentioned in 3 News [%12], also there was 12 news on security, sporting events, in addition to general invitations for local activities [%48]. The Chairman of the provincial council was mentioned in a 11 stories [%44] covered his activities, field and press' statements, and meetings, out of 25 news stories have been browsed according to their display order on the official webpage, while 6 News allocated for his deputy [%24], and the Chairmen of Committees of council were mentioned in 8 News [%32]. The Chairman of the provincial council was mentioned in a 4 News [%25] covered his field press' statements, and meetings out of 16 stories have been browsed according to their display order on the official webpage, while 5 News were allocated for meetings of the Council [%31.25], and his deputy and heads of committees and members of the Board occupied 7 News [%43.75]. governor was mentioned in 11 news [%44] covered his activities his field and press' statements, and meetings, out of 25 news stories that have been browsed according to their display order on the official webpage, while his deputies occupied 3 News [%12] and 11 news were about activities of the municipality and its director [% 44]. Governor was mentioned in 2 stories [%10.52] covered his activities and press' statements out of 19 news stories which have been browsed according to their display order on the official webpage of the Department, while 17 stories covered the department news [%89.48]. 23 news stories [%92] were allocated for the conservative, covered his field and press' statements, activities, and meetings, out of 25 news stories which have been browsed according to their display order on the official webpage, while 2 stories have been devoted for statements by the province, [%8]. President of the Region was mentioned in 2 news stories [%8] about his activities and statements out of 25 stories have been browsed according to their display order on the official webpage, while 3 news were allocated for President of the Region Government and [%12], and 20 news stories about the region security events, and social services [%80]. governor was mentioned in 17 news covered his activities, field and press' announcements, and meetings, out of 25 news stories have been browsed according to their display order on the official webpage [% 68], while 3 news were allocated to his deputy and a member of the Council [%12], as well as 5 News have covered different events in the province [%20]. only one news story was devoted for the governor covered a single meeting for him, out of 25 news stories which have been browsed according to their display order on the official webpage [%4 ], while there were 6 news about his deputy [%24], and 18 news story distributed on his aides, districts surrogate, [%72]. the Governor occupied 5 News stories [%23.8] covered his interviews, meetings, and statements, out of 21 news stories have been browsed according to their display order on the official webpage, while 14 stories were specified for his deputy, associates, and managers of municipalities, [%66.66], and 2 more news, one was a declaration on a tender, and the other was a historical story of one of the cities of the province, [%9.42]. 10 News were devoted for the governor, covered his meetings, interviews, and statements out of 25 news stories have been browsed on their display order on the official webpage [%40], while 10 News allocated for his deputy, aides, heads of committees in the Governor's Council, [%40], and 5 stories had covered the security and public-service affairs [%20]. 8 News, is all that have been published during the preparation period of this report, and they all were specified to cover the President of the Provincial Council news, his meetings, his interviews, and his statements, [%100]. The absence or absenting of standards of transparency in the free access to information, and taking into account the public's right in services access. Producers of informative material that belong to official websites assume that these websites are ad hoc for activity coverage of the official, President, Minister, or Director, so the personal photos outweigh the informative material associated with service, and the job is limited to routine activities, like greeting guests, going on visits, or travel; all this come on account of providing public information regarding what kind of expensive efforts these institutions are making to offer services for the publics. Absence of interaction, in general, in the official websites. As a result of modest techniques in web design, it's difficult to access public files related to basic services, like examination results, logs of grants for social groups; it takes long time and multi efforts in order to access information. The majority of the official websites that have been monitored for this report neglect providing informative service in languages recognized in the constitution, as well as English. The majority of official websites do not keep regulated timings for publication, they stop working intermittently, as well as they publish news and official statements related to old events. The visitor for those websites finds difficulties in getting materials and files within the archive, and often can not find them, or the website is suspended or freezes once you search for a word or an address. The official websites avoid disseminating polls and surveys of public opinion about their informative service, or quality of work provided by the concerned institution. The organizers of those websites don't initiate to conduct investigations or reports on the nature of work in the institutions facilities, and their performance preview, especially those are concerned with the interaction with publics through daily field work.